How much does interior design cost in Dubai? Interior Design Cost in Dubai. Home » How much does interior design cost in Dubai? How much does interior design cost in Dubai? How much does interior design cost in Dubai? When even thinking of getting an interior decor done for your home in Dubai, the primary question that comes to anyone’s mind is this. Home is the sanctuary where memories are created, love resides, friends always belong and laughter never ends. It’s the place you want to run back to after a hard days work. As “home” plays such a pivotal role in our lives, it should be a place that resonates with your personality, lifestyle and tastes. Herein comes the role of a professional interior designer who can translate your aspirations into a reality. Interior design cost in Dubai used to be very high, making you reconsider any plans for interior makeovers. Platforms like Zylus.com is helping you to cut down the cost of getting the interior done. For comparison purpose, just let’s look at the cost of interior design in Dubai, in general.But, with so many designers and contractors to choose from and such an array of furniture stores, before launching into home décor, one needs to first assess the quality of designer, the type of service they offer and their charges. 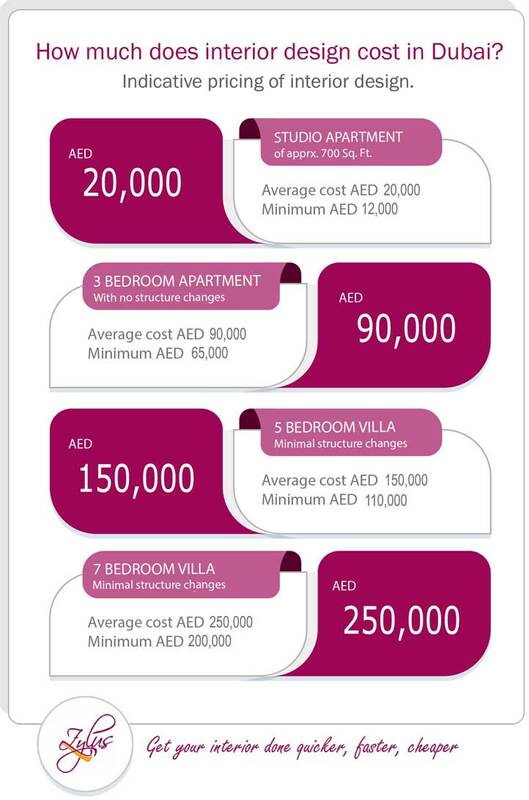 Also, one needs to consider the what will be the actual cost of interior design in Dubai. You know what? Zylus Online Interior can cut down the cost of interior drastically. Give a try here! Turnkey Design firms: Many of these will offer free design as a bait, provided you award them the contracting. This is a situation to be wary of, as high design fees will be built into the contracting cost. It is always better to separate design and execution. Also, sourcing fees of 6%-12% will be charged on bought-out items. Design Consultancy Firms: For a 3 bedroom residence, the design and supervision costs can start from AED 37,000 ($10,000) depending on whether it is an apartment or a villa and also depending on the degree of customization. Sourcing fees will most probably be charged here also. Furniture Shops: Most furniture shops will design your room for free provided you buy all the items from them. In case you don’t have a minimum spend of AED 10,000 with them, you need to pay design charges ranging from AED 1200- 3000. The downside of using this service is that there is no variety in the styling as all items are from one shop. Online Design Platforms: Online interior design portals offer the flexibility of doing one room at a time, thereby allowing customers to defer their expenditure over time. The cost would vary depending on the deliverables given by the website. Websites like Zylus.com charge AED 2600 ($708) for a full room design package that includes multiple designs from highly experienced designers, interaction with designers, photorealistic 3D views and shopping service. Other cheaper platforms with lesser experienced designers will offer you a room design for AED 1200 ($330) without 3D views and with one design concept only. Seeing the huge variation in prices possible, it is best to be very transparent with your designer about tastes and budgets. Online platforms like Zylus.com will use your budget as one of the starting points of the interior design cost and offer complete transparency in the sourcing process. This clarity prevents unpleasant surprises of budget over-runs at the end of the project. Interior design cost in Dubai is now at your control as you know what exactly you are paying for. Your home is your personal haven, and nothing can raise your spirits like a welcoming, beautiful, comfortable home. So, research well your options for selection of designer, have clear interior goals and budget indications – and get started !! Simple, easy steps to get your interior done!